As the geneticist at Ask a Geneticist, I get a lot of questions about human evolution. These questions mostly focus on whether evolution is still ongoing. I usually answer that of course it is and give examples like changing skin color, the ability to drink milk as an adult, or sickle cell anemia. A new paper just out in Nature Genetics gives us another example. In this work, researchers found that groups that tended to eat more starch had more amylase in their spit. This makes some sense as amylase is the protein that breaks down starch into sugars we can use. The researchers found that the groups that had a starchy diet had more amylase because they had more copies of the amylase gene. These two findings are interesting for a couple of reasons. First it is an example of ongoing human evolution. In groups that eat a lot of starch, folks with lots of copies of the amylase gene were presumably able to get more out of their starchy diet. And so they did better, had more kids, and eventually came to dominate their groups. The other interesting point is how this advantage came about. Instead of having a different version of a gene that gave an advantage, these folks had a different number of copies of the same gene. This is called copy number variation. And it is becoming very clear how important this type of gene regulation is. Our bodies can't effectively use the starches in our diet unless they are first broken down into simple sugars. This is where amylase comes in. Amylase is the protein in our spit that breaks the starch down. As I said, researchers found that groups of people who eat a lot of starch have more copies of the amylase gene. So which groups would these be? Anyone who farms their food would be predicted to have extra amylase genes since their diets tend to be high in starch. Same with anyone who hunts and gathers in the desert. Hunter gatherers who live in rain forests don't tend to eat a lot of starch. Nor do arctic hunter gathers. So we would predict that these groups should have fewer copies of the amylase gene. And that is just what the researchers found. They studied seven groups of people. Their examples of groups with a high starch diet were European Americans, the Japanese, and Hadza hunter-gathers. For groups with a low starch diet they looked at two rainforest hunter-gatherers, the Mbuti and Biaka and two pastoralist groups, the Datog and Yakut. There was a lot of variation within each group but on average, groups who ate more starch had more copies of the amylase gene. Groups with a high starch diet averaged seven copies of the amylase gene compared to the five copies seen in groups who ate a low starch diet. So at least between groups, the amount of starch in the diet correlated with the number of amylase genes. Here's how this difference might have come about. Some group of hunter-gathers switched over to farming or moved to the desert*. Their diet became more starchy. People in the group who could deal better with starchy food were more successful. Success here means they were able to get more out of their food so they were more likely to survive and have kids during hard times. Over time, the group would shift to having more people with extra amylase genes. So the starch eating didn't cause more amylase genes to appear. People who made extra amylase did better and had more kids. This is pretty typical of natural selection at work. For example, being able to drink milk as an adult probably happened the same way. Most likely there were always a few people in a group who could drink milk as an adult. But it didn't really matter until dairy farming took off. Once this happened, then drinking milk as an adult would become a real advantage. So people with this ability would be more successful and have more kids. And eventually become the norm in places like Northern Europe. The amylase case worked similarly. Except that instead of a small DNA change, the extra amylase came from extra amylase genes. From what we have studied in the past, this is not the typical route to extra protein. To understand why having extra amylase genes is a unique situation, we need to go over how genes work. 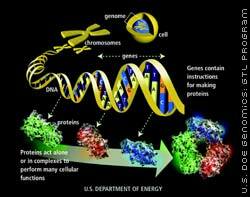 A gene is really just the instructions for a protein and the protein is the thing that does the work. Let's use amylase and its gene as an example. The amylase gene has the instructions for making the amylase protein. The amylase protein is what breaks down starch in our diet. For almost all of the genes we've studied to date, the way to get more protein is to muck with its instructions. You might get a small DNA change that has the gene crank out more amylase. Or a different one that causes a stronger amylase to be made. But the number of copies of a gene stays the same. This is certainly what happened with our milk example. In that case, a small DNA change causes the lactase gene to stay on longer. There weren't extra lactase genes lying around. And this has been the case with nearly every other gene studied. But for amylase, we get extra amylase by having extra genes. Having more than two copies of a gene is called copy number variation or CNV. Scientists didn't used to think that it was very common but as we look deeper into the human genome, we are finding that they thought wrong. For example, in a recent study scientists found around 1400 of these changes that totaled over 360 million base pairs. That is 12% of our DNA! Obviously CNVs are pretty common. And having these extra genes can have an effect. We've already talked about the amylase gene. But there is also another gene called CCL3L1 that can come in more than two copies. Scientists have found that folks with extra copies of this gene tend to be more resistant to HIV and so are less likely to end up with AIDS. As scientists study CNVs more and more, they will undoubtedly find more examples like amylase and CCL3L1. Given how common CNVs are, I suspect we'll be hearing a lot more about CNVs and how they affect our health. * The increase in the number of amylase genes might have happened earlier in evolution as well. When the researchers compared human DNA to chimpanzee and bonobo DNA, they found that our closest relatives had the usual two copies of the amylase gene. This might mean that the increase in amylase genes happened very soon after the human-chimp split. Genes are just instructions for proteins.